The Alexander Technique teaches you how to reduce tension and effort and improve posture, coordination, and breathing by changing how you use your mind and body, allowing you to enjoy increased freedom and ease in activity. It was developed over 100 years ago and is recognized world-wide for its effectiveness. It is not a method of exercise for health. It has no form or exercises to practice. It imparts a specific set of strategies for changing habits, and it is taught through a particular teaching method. Once you learn the skills, you can apply them to anything that you do. The first premise of the Alexander Technique is that the mind and body are one, inextricably linked in everything that we do. For example, if you lift your arm, you must have the intention and impulse to lift the arm (mental) and you must have bones and muscles to perform the act (physical.) Alexander Technique teachers are interested in how you organize and coordinate yourself mentally and physically in the activities of your daily life. The Alexander term for this category of your fundamental habits of neuromuscular organization in all your activities is use. Because we go about practicing our habits of use over and over again, we get very good at them. These habits are familiar and they feel normal and right—but that does not make them beneficial, efficient, or effective. Learning the Alexander Technique helps you to become aware of your habits and enables you to make better choices about how you use yourself in all the activities of daily life. Our habits of use either support or interfere with our capacity for coordination. Engaging in any activity with poor use expends unnecessary energy and misapplied muscular bracing that interfere with the performance of that activity. F.M. Alexander’s personal experience of poor use as a young actor led him to discover a basic principle of how the mind and body work together in activity. Alexander (1869-1955) developed chronic laryngitis when he performed. Determined not to let his vocal problems end his career, he carefully watched himself in a mirror while speaking to see what was going wrong. He observed that he was pulling his head back, depressing his larynx, collapsing his chest, and gasping for breath. Eventually, he realized that poorly coordinated muscular tension throughout his body was compromising his ability to speak easily. Alexander gradually succeeded in solving his vocal problems, and through his experience, he developed a teaching method that encourages the mind and body to coordinate more efficiently as an integrated whole. Through years of experimentation and exploration, he found that the key to solving his problem was the relationship of the head to the neck and the back. He discovered that the head, neck, and back relationship profoundly influences coordination and well-being: If the head and neck are in a state of dynamic balance, then the muscles of the back have the potential to lengthen and widen, and the whole torso can stretch and expand. When the muscles of the torso are elastic—not rigid and stiff—the ribs can move more fully in breathing, and the joints can move more freely in movement. This elasticity, poise, and mobility facilitate ease, poise, and economy of movement in the performance of any activity. When collapse and/or excess tension are reduced, the innate righting responses of the body can function more easily, and it is easier to maintain an upright and centrally balanced carriage. Alexander developed a practical, precise, and pragmatic method for changing poor habits of use. The Alexander Technique focuses first on the head, neck and back relationship as the key to improved coordination. The Alexander Technique teacher guides the student in learning to observe and correct his or her habits of misuse. The student learns to think in a new way about movement: to mentally undo the old habits and make new choices—neck to be free, head to go forward and up, back to lengthen and widen. The teacher with a light guiding touch helps the student to bring about the improved coordination associated with those choices. Through a series of lessons, the student gradually develops the skill to recognize and prevent habits of misuse and to coordinate her/himself in a healthier manner. Then he learns to apply this skill while engaging in simple activities, such as sitting and standing, or complex skills such as playing a musical instrument or practicing martial arts. Alexander wrote four books to explain his discoveries and his method and in the 1930’s he began training teachers. To receive certification to teach Alexander’s method, one must attend a three-year (1600 hour) training course approved by one of the national societies belonging to the world-wide organization of Alexander Technique Affiliated Societies. 1. To become aware of our habits. Most of us don’t know how we use ourselves. We do things the same way all the time and we reinforce those bad habits over and over and get very good at them. These habits “feel right” because they feel normal and familiar to us—but they are not always beneficial for us. As we become aware of what our habits are, we can choose to change them. How do we change our habits? 2. To learn not to do. How to stop doing something. How to prevent something from happening. This is very important. If you are walking upstairs and want to walk downstairs, first you’ve got to stop walking upstairs. If you are singing C and want to sing B, first you’ve got to stop singing C. You’ve got to stop doing things mindlessly and give yourself the opportunity and the time to make a change. 3. To learn how to direct ourselves the way we want to go. How to consciously use our intention and attention and energy to organize ourselves before and during actions so that the body is elastic and responsive in activity rather than collapsed or stiff. This kind of directed thinking allows us to take care of ourselves during activity. 4. To learn how to reorganize the balance of the head in relation to the rest of the body. Alexander found that the relationship of the head, neck, and back is the key to good use. Alexander called this head/neck/back relationship the Primary Control, because it is the first requirement in a chain of events that culminate in better functioning or use. Alexander wrote that a certain use of the head in relation to the neck and of the neck in relation to the torso and other parts of the organism, establishes the best conditions for raising the standard of functioning of the whole. (Alexander, 1941/1986, p. 10) In other words, an appropriate head/neck/back relationship stimulates improved coordination of the whole body, lessening the effort needed to stay upright in gravity. As balancing becomes more efficient, excess muscular tension is reduced throughout the body. We develop an open, free, and expansive carriage as a by-product of improving our neuromuscular organization. The net result is poise and freedom of movement that facilitates the performance of any activity. In the Alexander Technique, we teach: “Let the neck be free to let the head go forward and up, to allow the back to lengthen and widen.” Alexander Technique teachers help the student let go of the excess tension and compression that make it impossible for the head to be poised on the top of the spine or for the back muscles to expand and stretch. We help the student experience the balance of the head in relationship to the whole back and reinforce this experience many times, so the student learns to bring about this balance for him or herself. The release of the neck, balance of the head, and lengthening and widening of the back combine with the positive supporting responses activated by the pressure of the feet on the floor to stimulate the extension of the whole body. If we do not interfere with this natural postural support, the body is free to extend up easily and effortlessly, with the head poised lightly on top of the neck. When the anti-gravity mechanisms are working well as described, the legs release the weight onto the ground, grounding the body in gravity. This is a neutral, relaxed, and balanced carriage that makes it easy for the body to move. The factor that facilitates good use is the ability to release the musculature. F.M. Alexander considered letting go of undue tension of the highest importance. In Alexander Technique terms, we want the muscles to release unnecessary tension so they are working most efficiently without any undue or excess effort in the performance of activity. We need some muscle tension to do work—that is, after all, what muscle contraction is—but we want to reduce the tension to only that which is necessary, no more, no less. For most of us, this involves a lot of letting go! In Alexander’s experience, the unnecessary tension that caused his vocal problems increased when he thought about reciting. The unwanted tension began to build even before he began to recite, merely as a preparation for activity. He had to learn to stop reacting to the idea of reciting by creating the excess tension. He had to learn to “do nothing,” remain quiet, not tense his muscles, not respond in the usual way. When he learned to “do nothing” in response to the thought of reciting, then something new and different could happen. A nerve can either transmit a signal, which is called excitation, or not transmit a signal, which is called inhibition. It can’t do both at the same time. To change coordination, first you have to stop sending messages along the familiar wrong pathways before you can send them down the right ones; for example, if you are at a crossroads and you are turning right but you decide to turn left, first you must stop turning right before you can turn left. The term that Alexander employed for making the choice to stop the habitual pre-set automatic patterns is inhibition. A habit is a stereotyped response to a particular stimulus. Inhibiting the habitual response allows you to choose a different response, so preventing the automatic response is the essential first step in changing a habit. Alexander wrote: “My technique is based on inhibition, the inhibition of undesirable, unwanted responses to stimuli and hence it is primarily a technique for the development of the control of human reaction.” (Alexander, 1941/1986, p. 114.) You can make the choice to do or not do, to channel energy either one way or another. You can say “No” to a habitual response in order to say “Yes” to a more constructive, more positive response, something you really do want. In other words, you have a choice in how you react. Alexander Technique teachers impart this useful skill of inhibition: changing habits by making a choice not to respond in the usual way. First you inhibit the habit—a mental process—then you choose to use the body better through another mental process that Alexander Technique teachers call direction. A direction is both an order or instruction and the course along which something is aimed. In the Alexander Technique, direction is both an intention and a spatial direction. You think, intend, project messages to yourself that allow and encourage freedom and harmonious coordination in activity. F.M. Alexander defined direction as: “the process involved in projecting messages from the brain to the mechanisms and in conducting the energy necessary to the use of these mechanisms.” (Alexander, 1932/1988, p 35.) By “mechanisms,” he was referring to all the neuro-anatomical structures required for any activity. In other words, we think and send energy necessary for the intention to happen. Mind and body are inextricably linked in one unified psycho-physical mechanism. For example, if you lift your arm, you must have an intention and energy and you must have bones and muscles. The way you lift your arm depends on how you think about lifting your arm. On the most basic level, the degree of tension and the kind of coordination you think you need to lift your arm determines how you perform that act. We use the mind, not mindless strength, to bring about change. We use our consciousness to monitor and eliminate unnecessary effort as we go along, taking care of how we are doing something as we go about doing it. 4) To let the arms and legs move out and away. First you inhibit the habit, next you choose to use the body better, then you apply the skill of direction to improve the head/neck/back relationship. As you become more skilled in this process, awareness /inhibition/direction happen virtually instantaneously. 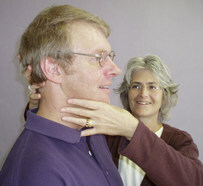 When the head and neck are in a state of dynamic balance and the back is expanding and lengthening, there is a resulting poise of the head, release of the throat, mobility of the ribs in breathing, freedom of the joints, elasticity and steadiness of the torso, that facilitate activity. This neutral, relaxed, balanced carriage provides a central foundation for everything that you do in all your activities of daily life. In the Alexander Technique, through using these three simple ideas: inhibition, direction, and the importance of establishing a balance between head and neck and the rest of the body, the mind leads the body to better use. Through this process, we gradually gain improved freedom of movement, greater ease in coordination, and increased awareness of what we are doing both mentally and physically. The Alexander Technique teaches the student how to use the mind to find a balance between excitation and inhibition, between non-doing and doing, activity and stillness. Then when we are empty, open, and receptive, our intention can play through the body freely and efficiently. Upper and lower body are connected by a lively spine and freely flowing energy, and we can act without the interference of self-created habits of unnecessary tension that obstructs smooth coordination in response to thought. In summary, the Alexander Technique is not posture, not movement, not mindless activity, but thinking in activity. It provides a set of self-management skills that can be applied to any activity. It offers mental strategies that can be utilized to help you become more aware of what you are doing and change what you are doing—while you are in activity. In my experience, learning these skills can assist the student to improve in the performance of any activity. Alexander, F.M. Conscious Constructive Control of the Individual. London: Mouritz. , Originally published 1923. Alexander, F.M. Man’s Supreme Inheritance. London: Mouritz. Originally published 1910. Alexander, F.M. The Universal Constant in Living. Long Beach: Centerline Press, 1986. Originally published 1941. Alexander, F.M. The Use of the Self. London: Gollancz, 1988, Originally published 1932. De Alcantara, Pedro. The Alexander Technique, A Skill for Life. Ramsbury: Crowood Press, 1999. Gelb, Michael. Body Learning. New York: Henry Holt, 1981. Jones, Frank Pierce. Freedom to Change. London: Mouritz, 1997. Originally published 1976. Vineyard, Missy. How You Move, How You Stand, How You Live. New York: Avalon, 2007.